About 17 seconds after first seeing this pattern I had not only downloaded the pattern but also sent my young one up to the 3rd floor to retrieve the yarn which was at the bottom of a tupperware container desperately screaming STRAGO! STRAGO! Babs and I both bought this yarn, Jamieson & Smith Natural Shetland, at Rhinebeck 09 for a colorwork project such as this. Hip hip hooray for pre-buying! This is an exceedingly satisfying color work project in that after a few rows you completely get the logic of the pattern and can visually predict what is supposed to be happening. 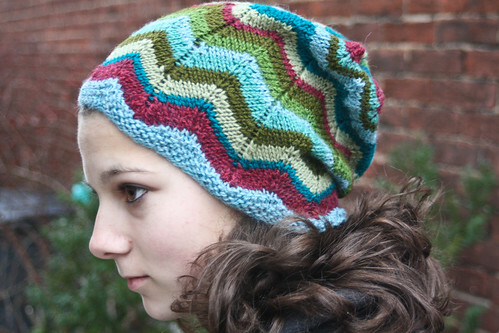 If you haven't tried stranded knitting, this might be a very nice first project. 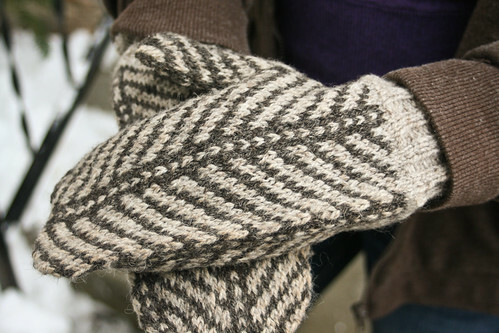 Although I truly loved this project, knitting these mittens gave me a little insight into why I might have such a pronounced aversion to socks. Simply put: there are two of them. Somehow my addled-1980s-teenage-former-stoner brain can't deal with the second _______ (sock, mitten,what-have-you) as it just feels like a do-over. Don't make me make that again, I've already made that and I want to make something else now! So you can see that I require a good deal of mental gymnastics to be able to finish a project like this as I just lose steam. Where is the knitting equivalent of a fluffer when I need one? Viggo, are you available? Several people asked me about the whole knitting-iPad intersection. WOW is it a game changer. It is the perfect pattern keeper! If you use the Goodreader app you can also annotate the pattern and mark your place, leave notes, as well as connect directly to your Ravelry pattern library. No more emailing the pattern to Gary at work asking him to print it out on his color printer and subsequent withholding of affection when he forgets the pattern in his office. So economical! I'm saving so much money! 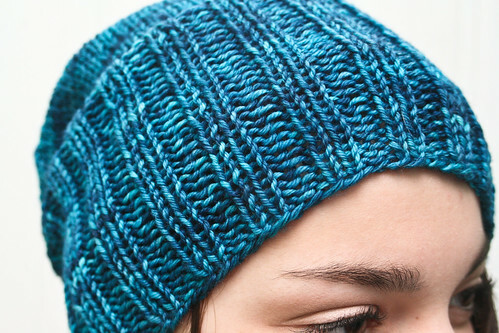 After all the pay-attention-to-your-chart color work knitting that's been happening around here, I've been in serious need of a plain jane zone-out knit. This is a first of a series of unimpressive yet satisfying plain knits that you'll be seeing up in here over the next several days. You'll be forgiven if you're not bowled over by them and wonder to yourself "...is that what knitblogging has come to?". Why yes, yes it has. Mods: None. I'm all about following the rules. Sometimes, like when you're watching hockey or have blown out your adrenals playing Angry Birds for three+ hours, you just need a pattern that you can knit and knit on without checking your new iPad(!!) to see which row you're on, you know? For all of you thinking about doing the recently released Through the Loops pattern Ida's Kitchen, please beware that you will be undertaking a project that is 100% addictive and may very well be one that you want to knit over and over again in a dizzying array of combinations (think Chevron Scarf and BSJ). Luckily if you've spent the last several years randomly acquiring skeins of yarn with no purpose at all, this won't be a problem for you. Yep. Yarn: Blue Sky Alpaca Mélange in 'Cornflower' and 'Pomegranate'; Random skeins of Brown Sheep Naturespun Sport in various shades (see below). This was one fast knit people. Two days tops. And so much fun to watch the colors change! This project has scrap-buster written all over it because you could easily adjust the pattern to accommodate the bit and bobs of sport weight that you have. 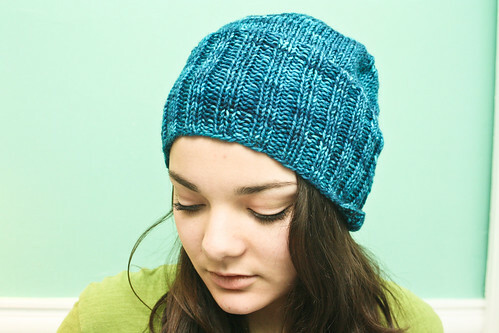 Virtuous Knitter Alert: For this hat I used yarn 100% from stash. Go me! I had some BSA Mélange on hand that I'd been dying to try. 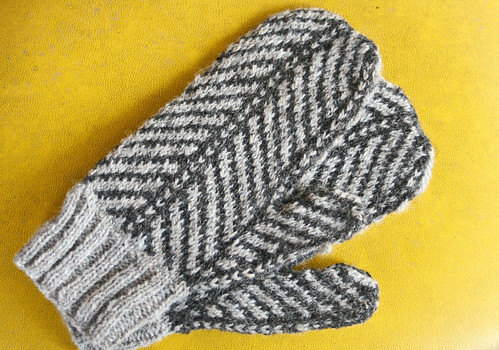 I also had a mitten kit composed of Naturespun Sport that I'd purchased a while ago and knew that the likelihood of making the mittens was become dimmer by the day, so I repurposed it and put it into service for this project. But of course me being perpetually stuck in a two-steps-forward, one-step-back mode, on my way to the airport last week ago I picked up more* BSA Mélange to make an even bigger and better Ida's Kitchen! So yeah, I'm a lifer. *to people keeping track of my StashPact 11 avowal to cease and desist from yarn gluttony, this purchase was made BEFORE I signed on, ok? Not much to say really about this pattern, you know, except HOLY TOLEDO IS IT EVER AMAZING. 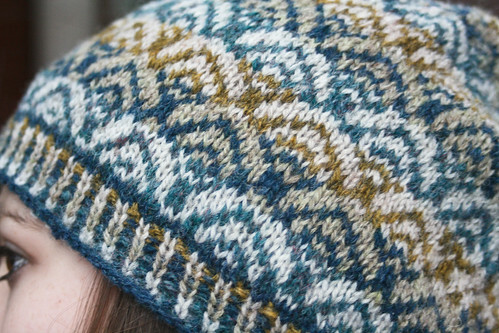 I mean, when I saw this pop up on Kate's blog I knew within a nanosecond that I'd be making it as it has all the hallmarks of a happy making project: intriguing, heretofore unimagined bands of color + tam shape that on me is a beanie but whatever + ability to raid my own personal cache of Shetland Spindrift + stretches of time during winter break when no one will be bugging me! In other words, Caller Herrin has KISMET written all over it. 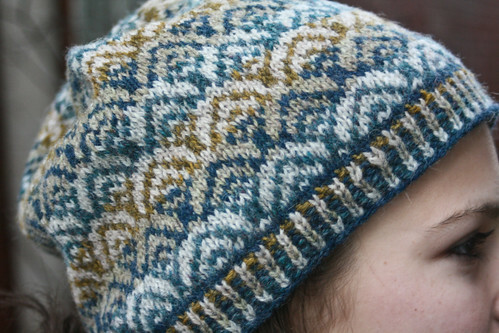 Yarn: Jamieson Shetland Spindrfit---> Ecology Pebble, Atlantic, Titanic,Bracken,Lichen and Eesit. About .30 of each skein. For real! Needles: size 2.5, which gives the perfect gauge in my opinion. Time to completion: Let's say about a week of interrupted/distracted knitting. I'm going to say that this project was slightly more challenging than the Tantallons were from a memorization perspective. 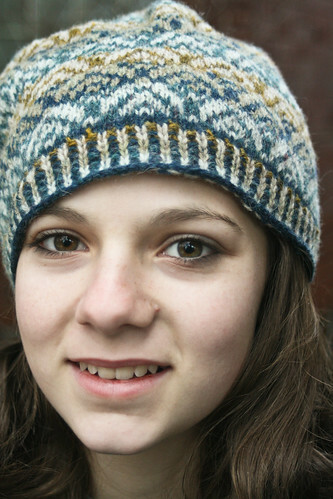 Kate noted that you had to 'think in 6s' while knitting it, and I feel that this was correct. If you've done patterns like this, you know what I'm talking about. 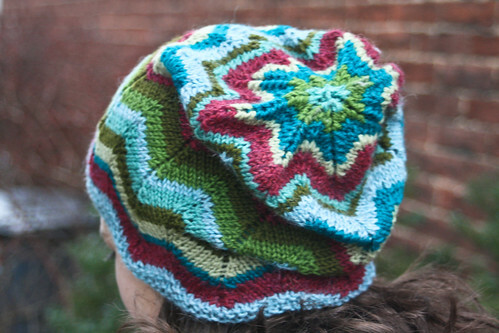 Many other versions of this hat are popping up around the blogosphere, I particularly like this one posted by THE Cocoknits, a.k.a. my fave Ottawa Senators fan and all around unbelievably talented knitter. 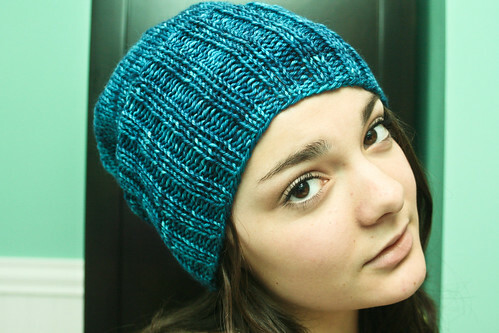 Her version is done in the yarn called for in the pattern, Starmore Hebridean 2-ply. This fact of course makes me insanely jealous, but she indicated to me that ordering it from the UK isn't really that expensive after all...so watch this space for some unbridled spending! Except no, I made a pact and promised I wasn't going to do that anymore...damn you accountability and mutual honesty! I guess I've been bitten pretty hard by the color work bug. 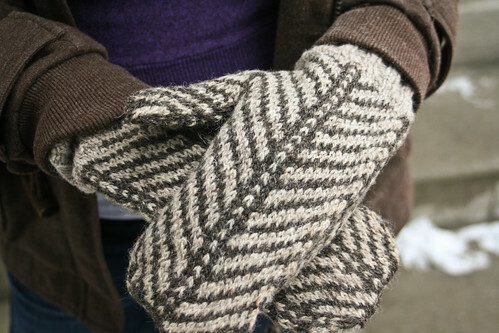 I'm currently working on the pair of Isidora mittens you see below. This pattern is from my other colorwork maven, SpillyJane, who was recently featured on the Yarn Harlot's blog, meaning that she now has to either hire a PR agent or enter the witness protection program on account of all the (well-deserved) attention she's getting!